In an average household with at least four family members, a toilet seat is used several times a day. If that is the case for you, it becomes essential to have one that is highly durable and long lasting. More importantly, it should also be easily removed to allow you to clean it thoroughly on a regular basis. The other aspects of a good toilet seat are that it should be a seat that should not wiggle when you sit on it. It should also be fairly comfortable to sit on even for long periods. Finding a good toilet seat can, however, be a difficult task. The market is flooded with countless options for it, which makes choosing one quite overwhelming. If you’re trying to avoid all that, then you have reached the right page. Today, we will be reviewing the Bemis M1955C-000 Elongated Toilet Seat. Bemis is a manufacturing company that was founded all the way back in 1901. At present, the company is in the fourth generation of family ownership. Bemis is well-known in North America to be one of the best non-automotive producers of contract plastic-injection molded components. With regards to their toilet seat, they bring style and innovation along with high quality and durability in all of their products. They sell their toilet seats all over the world for residential and commercial properties. With the wide variety of toilet seats they offer, their design can effortlessly integrate into any bathroom. The Bemis M1955C-000 Elongated Toilet Seat is a simple yet elegant product. However, do not be fooled by its simple looks as the toilet seat is loaded with a ton of features. Let us discuss them at length below. The Bemis Toilet Seat has a simple design and is available in two colors: white and black. All of the seats hinges and bumpers are color matched. You can find this same design for round toilets too. Unlike other toilet seats that are O-shaped, this toilet seat is in a U-shape. While this is good for home use, this is particularly great if you are looking to fix a toilet seat in a commercial space. With regards to this seat’s dimensions, they are 18.5 by 14.2 by 2.4 inches, and it weighs a little more than four pounds. This sizing makes it perfect for this seat to be used on most toilet bowl brands such as American Standard, TOTO, Kohler, and the likes. Since this toilet seat is not only targeted for people in residential spaces but also in commercial spaces, the build is of utmost importance. Bemis, being well-known as one of the best in plastic-injection molded components, has ensured that their toilet seat is also of the same phenomenal quality. This toilet seat is made from a commercial-grade plastic, making it ideal to use absolutely anywhere. The seat will resist wears, chips, and stains. Furthermore, it will last you for a long time. But it doesn’t end there. Bemis has taken this a step further by featuring a highly non-corrosive 300 series stainless steel pintles and posts. All of these ensure that this seat is meant for long-term use. Lastly, the way this seat is built is also quite impressive. It is manufactured in Sheboygan Falls, WI, United States using only processes and materials that are earth-friendly. Even the packaging in which this toilet seat will come to you is made from recyclable materials. While this seat does not have any cushioning, the plastic itself is quite comfortable to sit on. It has a smooth texture, which, in turn, makes it comfortable for people to sit on it for long periods. The Bemis toilet seat comes with STA-TITE technology. For those who do not know what this technology is, STA-TITE is a breakthrough in the installation of toilet seats. It significantly improves the mounting hardware from top to bottom instead of inside out. This is a much simpler system and is more secure too. It will easily cut the installation time to just a few minutes. Best of all, it will prevent the toilet seat from loosening. You will notice that most companies that sell toilet seats either don’t offer any warranty or offer warranty only for a couple of months. This, however, isn’t the case with the Bemis toilet seat. The company offers a one-year warranty on their product. The Bemis M1955C-000 Elongated Toilet Seat is a highly durable, U-shaped seat that works well for residential and commercial properties. The material used for the seat is made from commercial-grade plastic, which will make the seat last a long time. It also comes with STA-TITE technology, which will cut the installation time to just a matter of few minutes and will keep the seat tight and well secured. All the hinges and bumpers are color matched. The seat is made from earth-friendly materials and processes and is manufactured in the United States. Now, we reach that part of our review wherein we put the product to the test by comparing it with another similar product. We found that the American Standard Elongated Commercial Toilet Seat is a close match to the Bemis M1955C-000 Elongated Toilet Seat. Both of these toilet seats are almost identical in terms of their design. They both have a U-shaped appearance and are made from commercial-grade plastic. This material ensures that they are durable and long lasting. 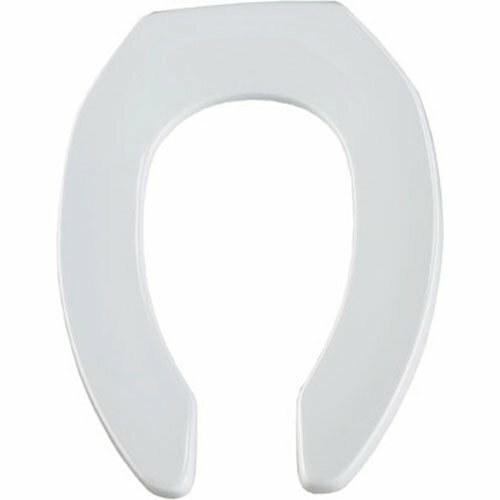 However, the reason why the Bemis toilet seat has the upper hand is that it comes in two colors, unlike its counterpart that only comes in one. In addition, the Bemis seat boasts STA-TITE technology too, which the toilet seat from American Standard does not feature. The Bemis M1955C-000 Elongated Toilet Seat is a product that is a must-have. This is particularly great for those who want a hard-wearing toilet seat for their commercial space. The seat is only made from the most durable and long-lasting materials and will take you no more than a few minutes to install, thanks to the STA-TITE technology.